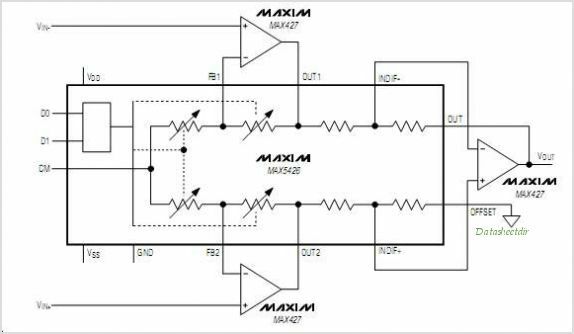 The MAX5426 is a precision resistor network optimized for use with programmable Instrumentation Amplifiers The MAX5426 operates from dual 5V to 15V supplies and consumes less than 40A of supply current. Designed to be used in the traditional three op amp Instrumentation Amplifier topology, this device provides noninverting gains of 1, 2, 4, and 8 that are accurate to 0.025% (A-grade), 0.09% (B-grade), or 0.5% (C-grade) over the extended temperature range (-40C to +85C). The MAX5426 is available in the 6.4mm x 5mm 14-pin TSSOP package. This is one package pinout of MAX5426,If you need more pinouts please download MAX5426's pdf datasheet. 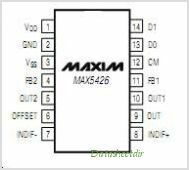 This is one application circuit of MAX5426,If you need more circuits,please download MAX5426's pdf datasheet.